Derwent has had a passion for producing the finest quality pencils since it's formation in 1832. This commitment to excellence and reputation for innovation is displayed perfectly in the Derwent range of fine art media. From the popular Graphic, Artists, Pastel, Studio and Watercolour ranges to the innovative Graphitint and Tinted Charcoal ranges, and not forgetting the vibrant Inktense which is available in pencil form or blocks of pigment. For those looking for a softer cores there are the Procolour and Coloursoft ranges. 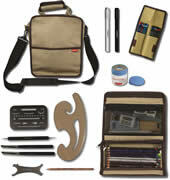 Derwent fine art media have something for every artist. Combining the smooth, easy laydown of a Coloursoft pencil but retaining the strong point and harder core of an Artist pencil, the Derwent Procolour has been designed to provide a combination of these two popular pencils. A wax based core allows the Procolour to glide like oil whilst remaining clean, blendable with a non-waxy feel. The highly pigmented cores have a unique formulation that ensure the point remains strong and sharp for intricate work. 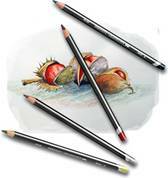 The Derwent Artists pencil is a broad, round pencil with a traditional wide core which means you can make broader strokes in free and expressive drawing. 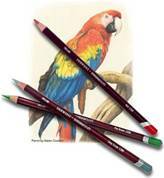 Derwent Artists pencils have a slightly waxy texture which allows you to layer and blend with ease creating a vast range of different tints and hues. The Derwent Studio Range shares the same colour core as the Derwent Artists, but is slimmer for a crisper, more detailed finish. 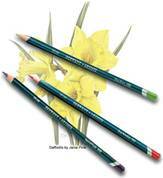 Derwent Coloursoft Pencils are the softest of pencils in a strong and vibrant range of 72 Derwent colours. Derwent Watercolour Pencils can be used wet or dry, on wet or dry paper, to achieve a variety of effects, from bold, vibrant images to delicate watercolour washes. Derwent Inktense Blocks are perfect for covering large areas with the vivid, intense colours of the Inktense range. 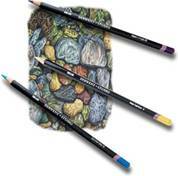 Derwent Inktense Pencils have a highly blendable texture and comes in a range of jewel-like colours. 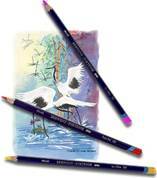 Derwent Pastel Pencils enjoy all the beauty of pastel in a convenient, less messy form. 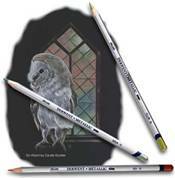 The Derwent Drawing Pencil is perfect for natural studies, wildlife and portraiture. 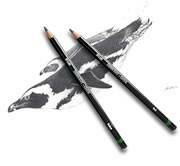 Derwent Charcoal & Tinted Charcoal ranges have all the properties of traditional charcoal and none of the mess. Simply add a little water to your Graphitint sketch and a hint of colour in your sketch becomes a rich, vibrant colour. 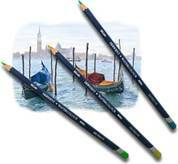 All sketchers will need some graphite pencils and the Derwent Graphic range, with it's 20 grades, will have something for every artist. Derwent Sketching are a wonderful choice for freestyle sketches and bold line drawings, allowing complete and spontaneous freedom of expression. 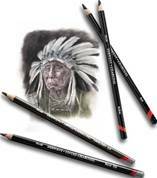 The Derwent Watersoluble Sketching Pencil is a graphite pencil that, when water is added, creates beautiful, soft effects. The Derwent Onyx Pencil is made from smooth dark graphite and allows you to instantly create dense rich jet-black tones, even darker than a Graphic 9B. 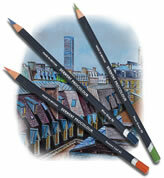 The Derwent Watersoluble Graphitone is a pencil-shaped stick of pure, artist quality water-soluble graphite. Brand new from Derwent, these Graphik sketching pens have high quality nibs manufactured in Japan with water based, pigment ink. Available in traditional black and sepia they also come in a great graphite grey. A great new addition to the Derwent fold! 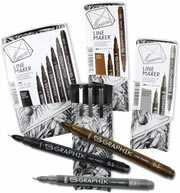 The fabulous Derwent Graphik Line Painter Pens have an opaque pigment paint, delivered via a 0.5mm nib. The water based ink can be mixed when wet and manipulated to create different effects but is permanent and lightfast when dry. Available in 20 stunning (and brilliantly named) colours! Derwent Metallic Colour Pencils introduce a little sparkle to your sketches and drawings with their bright, highly reflective colours. Best used on dark backgrounds and perfect for adding brilliant highlights and definitions. The Derwent Pastel Range, relaunched in 2011, now has a much softer texture allowing for easier blending and to lay down colour far more easily. This range is now discontinued by the supplier and once what we have left is gone it is gone! 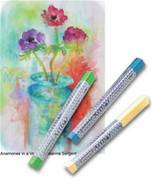 Wax based, water soluble bars of pigments, Derwent Artbar are a wonderful new innovation! The clever people at Derwent have developed many, many accessories over the years to help you make the most of your pencils. The Derwent Rexel Blackedge Pencil is made for carpenters and joiners - skilled craftsmen who need specialist tools, right down to their pencils.